Global Access cannot stress enough to our independent dealer network, and to end-users alike, that all powered automatic gates should be fitted with safety devices to ensure the gate is as safe as it can possibly be for the user and people in general. Unfortunately, as there are no regulations or legislation associated with gate safety in Australia, it is often overlooked. As there is a cost associated with having safety devices fitted as part of an automatic gate solution, such safety devices are frequently declined or even left off a quote to make for a lower priced solution, and therefore the risk that an incident may occur is increased! Global Access would like to remind you that as an Installer or Owner of an automated gate system, that you have a Duty-Of-Care to the general public (family, visitors, passers-by, and even trespassers) that a gate system is ‘safe’. If a gate is deemed to not be safe, any party injured by the gates is likely to sue for the damage that has occurred. Be mindful that as the owner of an automated gate system, if you choose to make a claim from your insurance provider, the insurer may decline to make a payment as the gates are not considered safe. Similarly, although no legislation currently exists in Australia regarding the safety of gates, a court of law may deem that a gate is not safe and reward damages to the complainant, especially in the event of injury or even death to a person! 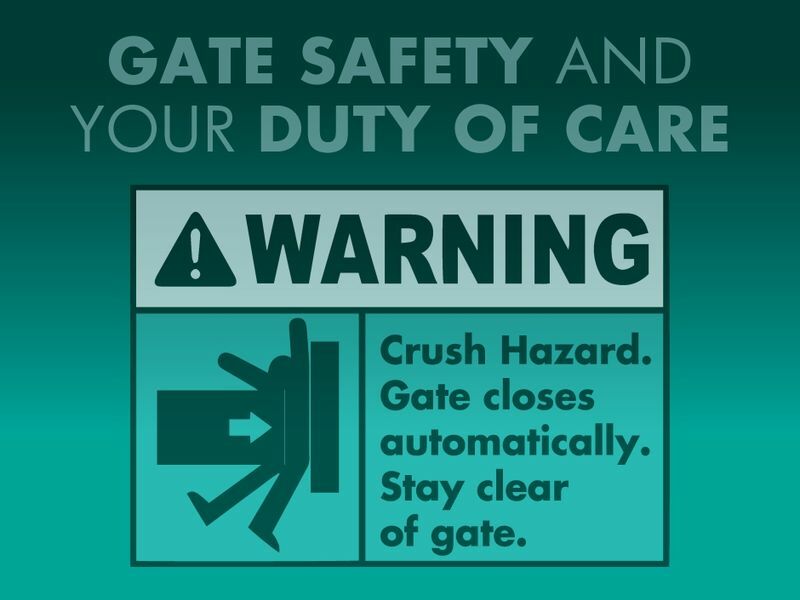 As an Installer of gate deemed to be unsafe, you may also be found liable, and risk litigation, it is best practice to fit a gate with appropriate safety devices to mitigate any risk to a person or vehicle. To view our range of safety devices, please CLICK HERE.